A Victoria Scroggins/Susan Kent Curated Joint for 2013. How were your holidays? Did you make it through your family stuff? Are you in financial recovery and emotional detox? You know what we all need? A night out, just us – hanging, drinking a beer and sharing stories. Doesn’t that sound perfect? Well, my friends, done and done. The 1st Monday of every month, we will feature 3 incredible performers who will share their true, real-life, awesomely amazing personal stories, live, right in front of your face. I know. Amazing, right? But, wait, there’s more! Victoria and I did get our storytelling start with our open mic, Tell It: Brooklyn, so what would a Tell It [colon] show be without some audience participation? It wouldn’t be a Scroggins/Kent joint, that’s for sure. So, we’re also gonna let YOU drop your name in a hat (or other receptacle) for a chance to tell your own true, real-life, awesomely amazing 5-minute story onstage in front of OUR faces. How f’in cool is that? And … stay tuned right here, on Facebook at www.facebook.com/tellitbrooklyn, or Twitter @TellItBrooklyn, for updates as we get closer to the show. 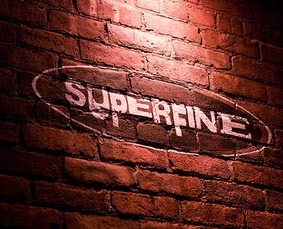 *Superfine is an awesome restaurant/bar whose regular biz hours are Tuesday – Sunday. Food will not be available during our show, though the bar will be wide open.